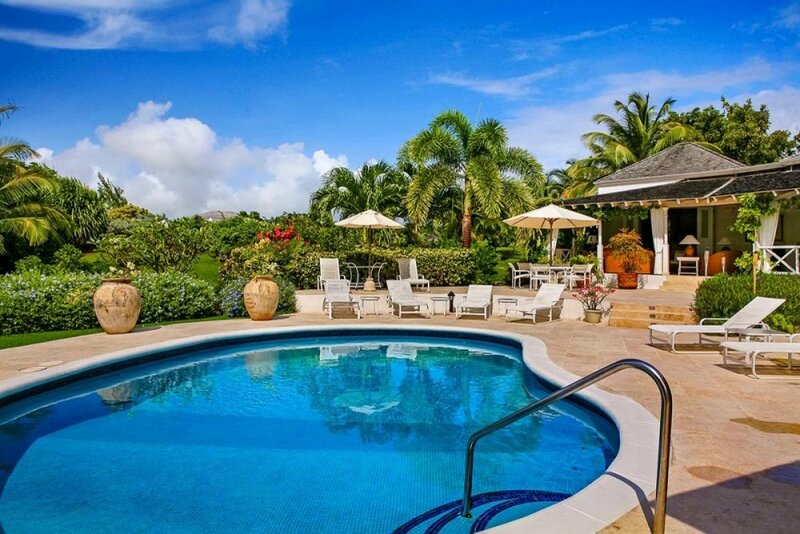 Ixora Villa is located off of the 16th Fairway on the Royal Westmoreland Golf Course. This luxurious private home features four air-conditioned bedrooms and four and one-half baths. Three of the bedrooms are in close proximity to one another, while the fourth is set off by itself for added privacy. In addition to the on-site golf course, the villa also has a tennis court, and the outdoor terrace (located by the swimming pool) offers ocean views. Ixora Villa is a lovely and well designed 4-bedroom property located on the prestigious Royal Westmoreland Golf course, set on a 3/4 acre of immaculately kept gardens off the 16th fairway. As guests enter the villa, two bedrooms are located to the right of the foyer and a third to the left, while the fourth bedroom is nestled in a separate wing with views of the sea and a four-poster bed. All of the bedrooms are equipped with air-conditioning and en-suite bathrooms. The foyer, with its high, pickled ceilings, leads guests into the living room. This lovely space opens onto the covered patio, which takes guests on to the swimming pool. Here lounge chairs invite guests to relax with a good book and a cool drink. The slightly elevated kitchen looks onto the dining terrace and informal seating area, and offers another vantage point from which the pool and garden can be seen. There is an additional view of the ocean from the outdoor terrace and pool. A small study and powder room are also a part of this villa. A feeling of space and light is present throughout the home due to the layout of the property. * Ixora Villa is located within a gated community. * DSL Internet access available for guests with laptops. * Cook and staff attend to your every need and work 6 days a week. Only 2 meals can be prepared; breakfast & lunch or lunch and dinner.